Mark and Conrad finally got to test out their new tent and it turns out that it effectively shields them from Matt's snoring and most other background noises. It's a good thing too because there are a lot of people camping in many of the places we visited and they are not shy about plopping their tents within a few feet of yours. We're used to a little more breathing room when we camp. On the plus side, the toilets are usually clean(ish) and stocked with toilet paper at the Department of Conservation sites. My goal for this trip was to make sure that Mark and Conrad got to see a glacier and a mountain. Check and check. We tried to alternate death hikes (if you ask the kids) with some 'fun' activities. Our visit to Queenstown was almost a repeat of our visit 15 years ago (Shotover Jet, gondola, and luge) but we got to see a lot of new things too. We skipped the bungee jumping and river sledging this time but the boys did watch some bungeeing. It turns out that this is not necessarily a PG-rated activity. They learned a few new words and gestures in the process. When can I stop walking? A hot spring river and waterfall. Great photos!! 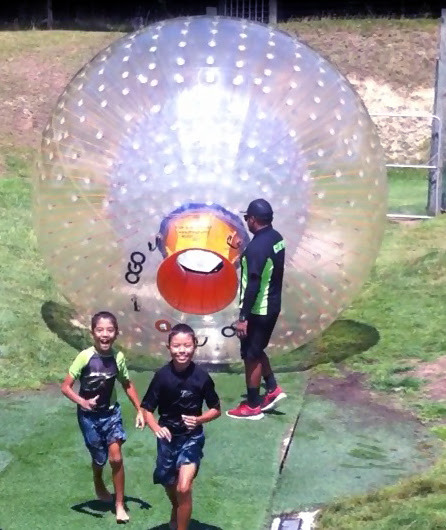 I want to try zorbing. It looks like your family is making the most of your time on land. We enjoy reading your blog and we're hoping to send some traffic your way! 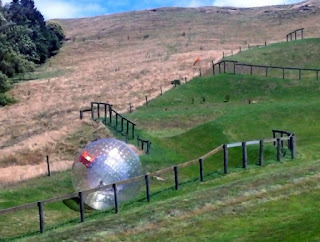 Me too, I wanna go zorbing! You have a fun life, and I like photo travel. Recently I was in a journey on Franz Josef Land https://poseidonexpeditions.com/arctic/franz-josef-land-arctic-for-explorers/ . Polar conditions and memorable photo this is what I brought. Certainly, it is a sufficient reason for buy a tour.